I was recently privileged to reconnect with my dear old friend Susan from high school, and spent a weekend playing and catching up with her. She's the kind of foodie that I aspire to be: she rarely uses recipes, preferring to use her imagination and sharp intuition as she cooks. She's also a vegetarian, which is a choice that's been on my mind lately as well. So, obviously, I jumped at the chance to cook dinner with her. I'll be sharing some of the recipes over the next few days, starting with the star of the show, the vegetable korma. This dish was amazing. It had 3 distinct parts (the veggies, the cashew coconut paste, and the tadka, a flavorful oil mixture added right at the end) that all came together in a symbiosis of flavor that I can't quite describe, but it was magical. I'm pretty proud of us for making something that looked intimidating at first into a fun, relatively easy adventure! Go team! 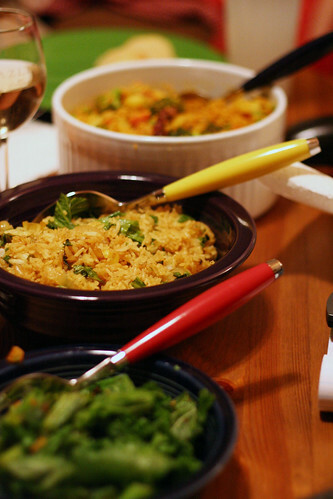 Tune in tomorrow for Part 2: Mustard Greens Fried Rice...and...oh my goodness, post #300! 1. Begin by making the paste. Soak the coconut in 1/2 cup of hot water for 10 - 15 minutes. Drain. Soak the cashews in some warm water for 10 - 15 minutes. Drain. Dry roast the cumin seeds, coriander seeds, and dried red chili over medium heat for a few minutes. Transfer the coconut, cashews and roasted seeds to a food processor or blender along with the ginger and green chilies. Process until you have a fairly smooth paste. Add a bit of water if desired. 2. Heat the oil or ghee in a large pan over medium heat. When hot, toss in the onion and stir and fry until it is translucent. Add the tomatoes to the pan and cook for another 5 minutes or until they thicken up and have a sauce-like consistency. Now add chickpeas along with 2 1/4 cups of water. Simmer for about 10 minutes. Add the carrots, potato, broccoli (if using) and peas (if fresh), turmeric and cayenne. Continue to simmer until the vegetables are tender. You can add more water to achieve your desired consistency. 3. Now add the ground paste to the pan and the sea salt. Reduce the heat to medium low and cook for another 10 - 15 minutes. 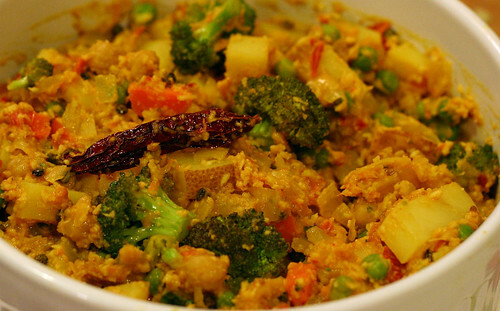 If you are using frozen peas, add them, and the curry leaves, if using, to the pan near the end of the cooking time. 4. To prepare the tadka, heat a few teaspoons of oil in a small saucepan over medium heat. When hot, toss in the mustard seeds, dried red chilies and the asafoetida or garlic. Stir and fry until the mustard seeds begin to pop. Immediately pour into the vegetable pot, stir and cover and let sit for 5 minutes to allow the flavors to blend. That looks delicious...I've never really given Indian cuisine a fair try....perhaps this will motivate me to try it!!! i have to make this! it looks beautiful and delicious.